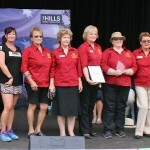 The Zonta Club of Sydney Hills Inc was awarded The Hills Shire Community Project of the Year on Australia Day. This was recognition for its innovative advocacy work: the Battered Barbie Project. Barbie dolls representing women experiencing different forms of family violence are displayed in a customised glass display cabinet emblazoned with ‘Zonta Says No’ banners. The project has featured in a number of White Ribbon Day events in the Hills Shire in the last two years.